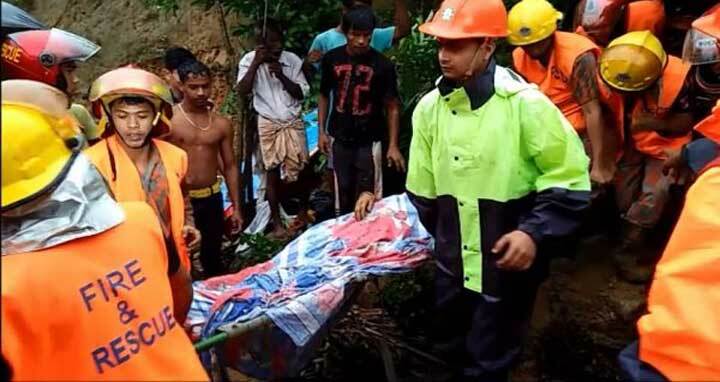 Dhaka, 3 July, Abnews: At least four people, including three members of a family, were killed in two incidents of landslide triggered by incessant rain in Sadar and Lama upazilas on Tuesday. In Lama upazila, three of a family -- Md Hanif, 30, his wife Rejina Begum, 21, and their family member Hanifa Begum, 5, were killed as a chunk of mud fell on their house in Sarai union around 3pm, said Sarai Union Parishad Member Ashraf Ali. On information, firefighters rushed in and they with the help of locals recovered the bodies from under the mud. In Sadar upazila, Protima Rani Dey, 45, wife of Milan Kanti Dey, was buried alive when a chunk of mud fell on her tin-shed house in Baruartek area around 12 noon. Being informed, firefighters rushed in, retrieved the body and sent it to Sadar Hospital for autopsy, said Iqbal Hossain, assistant director of local Fire Service and Civil Defence. Besides, multiple landslides occurred in different places of Ruma and Sadar upazilas, said Md Aslam Hossain, deputy commissioner of the district. “Using loudspeakers, villagers were asked to leave their vulnerable houses on hill slopes and take shelter in safe places,” he added. Many places of the district experienced heavy rain from Monday night.